So we've adjusted and it's been fantastic, actually. What were the adjustments, you might ask? It was adjusting our schedule to the new farm schedule. That took some time, I tell ya. Milking is fun, and great, but it has to happen every day, twice a day. We started out trying for me to do the morning, and Jeremy to do the evenings when he got home. Problem was with our personalities, I think. I mean, when Jeremy wakes up in the morning, he's full of philosophical thoughts and huge plans about our life. Me in the mornings? Not so much! In fact, when I would wake up early to go milk the goats, both the littles would wake up with me. I'm not very good at getting out of bed without knocking into them because they are both sleeping snuggled up to me in my bed. And when the children would get up early, the rest of the day was awful. Everyone was grumpy, including me. And then, nobody would nap at the same time. Noemi would nap, then Esmond would nap, then Noemi would wake up, then I would want to nap, and finally Noemi would nap again. And then Esmond would wake up. And it was terrible. I felt like I spent the whole day trying to get someone to go to sleep, or stay asleep. And we didn't get anything else done. Plus, I had another problem. You know all those moms who claim getting up before the kids for their quiet time is the best thing ever? Yea, I'm not one of those moms. I am an introvert, who needs quiet time by myself, but going to bed early with everyone else in the house to get up early with everyone else in the house meant I was not getting enough quiet time by myself. So I lost it. I ran out of everything it is that a mom needs. Patience, love, grace, and mercy. The Lord is an endless supply of all things necessary, yes. But, if you aren't meeting Him some where, some time, you aren't tapping into His limitlessness. And then your own, or in this case, my own, limitedness gets used up pretty quick. So Jeremy came up with a solution. He would get up in the mornings and milk the goats, and I would take care of the evening milking. And it works. I sleep in with the littles, everyone naps at the same time, I get a few minutes with Eowyn in the evenings while we milk after Jeremy gets back from work. (And actually, that works better for him too, because he didn't like having to go milk after he got home from work.) And then everyone goes to bed and I get an hour or two of glorious alone time. I'm just now recovering from my month or two of trying the go it alone with everyone all the time. We've gotten the house in order, and are keeping it that way (seriously, this is the longest that we've kept the house in order, and haven't lost it to the forces of evil again), and it's been wonderful! And my cup is being filled through late nights spent by myself. I seriously need to start going to bed earlier, though! So in all that adjusting and recovering, the things that aren't essential have been pushed to the backburner. We've slowed life down to the bare minimum in order to evaluate the needs and desires of our family. It's been a good, sweet time. It also meant the blog was pushed back. But since we seem to have gotten our feet back under us, it's time to start adding back to our life. And I think I have some time to start writing again. All that to say, I'm coming back. Thanks for reading and coming to visit! Oh this was so encouraging! So I'm not the only mama who has realized that it's IMPOSSIBLE to wake up early before the kids when you've got kids in the bed with you!? We sleep until about 8, since the littlest one wakes up around then. It just works. My nights are late, but this is only a season. You definitely aren't the only one! It is only a season, and will be over before we know it. 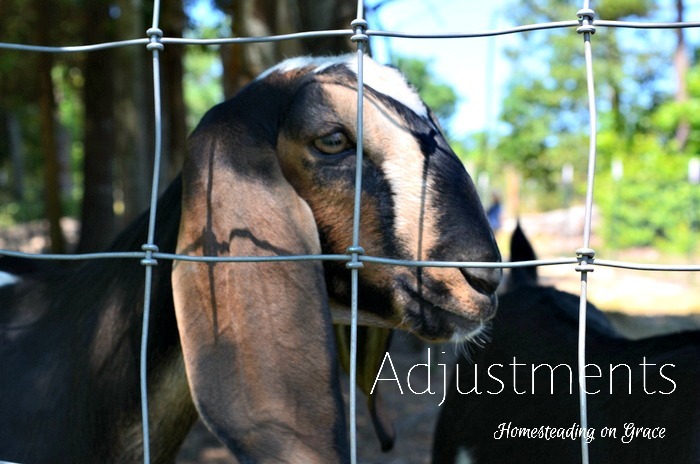 So glad you were able to figure out the adjustment. I always enjoy reading here!! And, I haven't been blogging too much either... trying to figure out "how" to get back... fully!!!! Maybe I need more me time. LOL. Thanks Bevy! Maybe summer just needs to be a time off for bloggers everywhere. It's about too hot to do anything anyway. GREAT POST! I truly appreciate your honesty. We all go into crazy mode this time of the year -- add in milking twice a day and having small children ~ Wowzers. Having gone through this myself, I can honestly say, it gets much easier when the children grow up a little. But no matter what, we can't get everything done in a day -- take it slow, enjoy and appreciate what you do get accomplished and for sure enjoy your children. Life has a way of working itself out for all of us. Looking forward to more posts, but only if you aren't stressed or feel obligated. We won't forget you and we'll all be here when you can post. Take care of you and yours first! Aww! Thank you Bobbie! You made me feel so much better. You are the best kind of advice-giver!